Lexi is named Midnight Shadow because she literally follows you around as if she were your shadow! She is very sweet and will do anything to get attention and affection. All she wants in life is to be loved and adored, and lavished with attention. She wants to be by your side at all times. 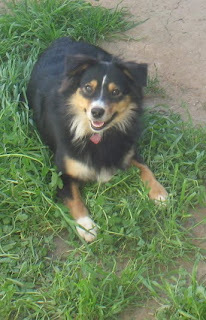 She is a very small 14 inches and weighs 25 pounds, but still has nice Aussie structure. She is a black tri with brown eyes and minimal white. 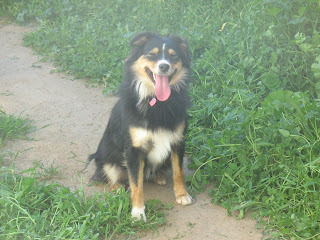 Lexi is extremely intelligent, crafty, and has a natural herding instinct. She has a mind of her own and can figure out how to get what she wants. Sometimes all she has to do is give us those cute puppy dog eyes, other times she invents her own way. Such as when she learned how to open the crate from the inside and outside! She has proven to be an exceptional mother to her puppies as well. She feeds them on a schedule, keeps them very clean, and just loves her new job.